Custom Card of the Day is an occasional feature on this site that showcases a random player’s picture on a random card set. I encourage you to click on the pictures to get a larger and clearer version of the cards. Sometimes I will pay tribute to a player by doing this, sometimes to a card. I re-create the original card design and add a new players picture and information to the card design. 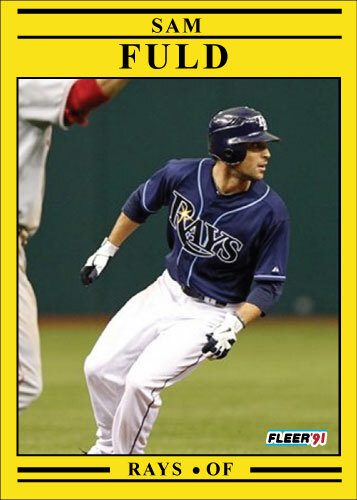 Here is a sample of one of my “Custom Card of the Days” a version of 1991 Fleer featuring Tampa Bay Rays rookie outfielder Sam Fuld. You know what I liked about this set? It took me like 15 minutes to the the template! As for the set itself, I hated it when it came out, but I’ve since softened up on it. It’s the only set I ever sold, too. 1991 Fleer was about as simple as cards ever got.